Got a town overrun with ghosts? Sick of dealing with neighbors who are up all night wailing and possessing their disused yard furniture? Tired of having to manually go and kick out those dead and forgotton NPCs who won't leave their old houses? This script mod will take care of clearing out those houses -- without having to resort to calling the Ghostbusters. The mod comes in two flavors: One adds a command to the cheat console to evict all ghosts families when you choose to run the command. The automatic version will schedule an automatic ghost eviction to occur at 1 AM after loading a lot and repeating every seven days (if you actually play one lot that long). The automatic mod also includes the command cheat version. To use the command cheat, open the cheat window while the game is in "live" mod and type the command ghosts.evict. 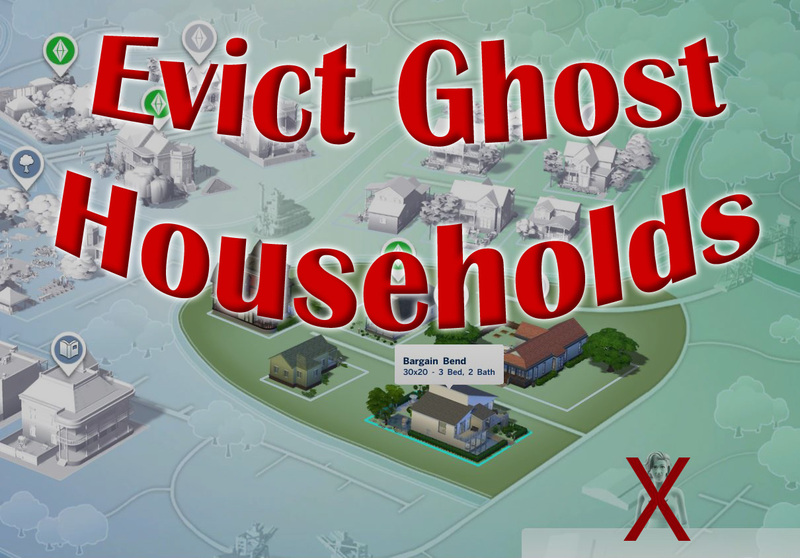 You will be informed how many ghost families have been evicted from the map. The automatic version works silently in the background. Both versions are careful to only evict those families that are made up entirely of ghosts, and are unplayed. The eviction will also skip a lot if you are visiting it at that time. For easiest installation, I strongly urge using The Sims 4 Mod Manager by Raxdiam for a fully automatic install, or you can install manually. To install manually, simply copy, do not unzip, the zip file into your game Mods folder. This is a script mod, so scripting must be enabled in your game options even if you use the mod manager for installation. 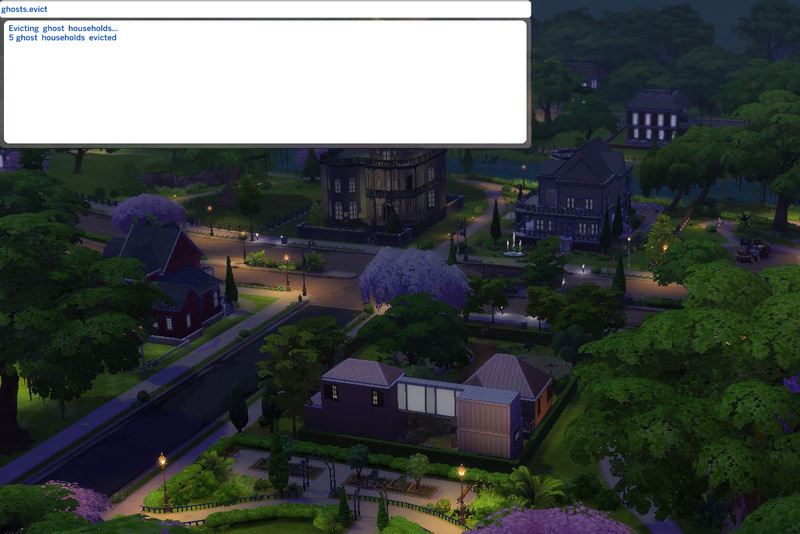 This mod was written and tested on Windows version 1.4.83.1010 of The Sims 4 (Feb. 3, 2015) of The Sims 4, but should be compatible with any Windows version since 1.0.732.20 (October 1, 2014). This mod will likely not work on the Mac unless it is updated to version 1.4.103.1210 (February 20, 2015). 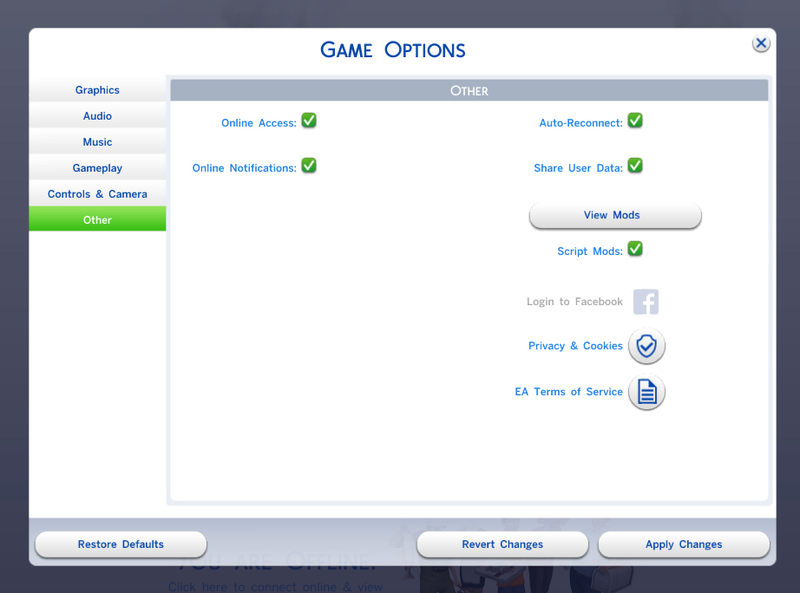 This update is critical for Mac users anyway, see Issues with Mods and CC in The Sims 4 on Mac for more info on this patch. The script source is included in the zip file. It is fully compatible with all known existing mods. Download and install only one of the mod flavors. Although they should not conflict with each other, the automatic version includes the cheat command already.